Lund Boats’ iconic Tyee adds the new 2075 Magnum edition to target massive freshwater lakes like Superior, Michigan, Huron, Erie, Ontario and beyond. Designed as a big water trolling platform, the new Magnum is the loaded with fishing features for lakes that demand big boat fishing performance. The new 2075 Tyee Magnum possesses high-end performance, power and fishability, as well as the ultimate in big water safety. Everything’s been efficiently engineered and built seamlessly into a massive, expanded cockpit area ideal for big water trolling. The Tyee Magnum also offers a deeper back for extra fishing space and safety. 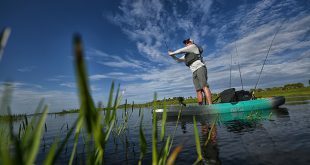 A high, wide back platform sports a handy leaning pad, giving anglers extra leverage when landing fish. Storage space is abundant throughout the boat. There’s storage for a cooler on the rear splash pan and an additional cooler storage area between the consoles. A large 35-inch/16-gallon insulated livewell is positioned in the aft deck for easy accessibility or for ice as well. Side rod compartments cradle four 10-foot rods and four 8-feet, 6-inch rods (starboard), while a center rod locker holds six additional rods up to 10-feet, 6-inches in length. A 36-volt battery compartment also comes standard, as do pre-wired trolling motor hook-ups. Two rear jump-seats quickly transition from passenger chairs to a recessed, aft leaning pad to put you closer to the action. The 2075 Magnum also includes four Pro-Ride seats for all day comfort and a slider on the drivers chair to adjust to any captain. At the helm is a custom Pro-Control dual console, loaded with ergonomic extras, including a high-end Infinity sound system with Bluetooth. As a topnotch trolling rig, the Tyee Magnum offers anglers Lund’s exclusive SportTrak® system, engineered to provide full fishing customization. Mounting and relocating downriggers, rod holders, cup holders, and other angling tools and accessories are done quickly, easily, and without drilling holes. The 2075 Tyee Magnum also has the ProTrak® System for easily applying a snap travel cover. Powerful yet athletic and loaded with features and abundant space, Lund’s 2075 Tyee Magnum redefines the notion of a big water fishing boat. Step aboard and experience the rewards of over 66 years of legendary Lund engineering, quality and craftsmanship. 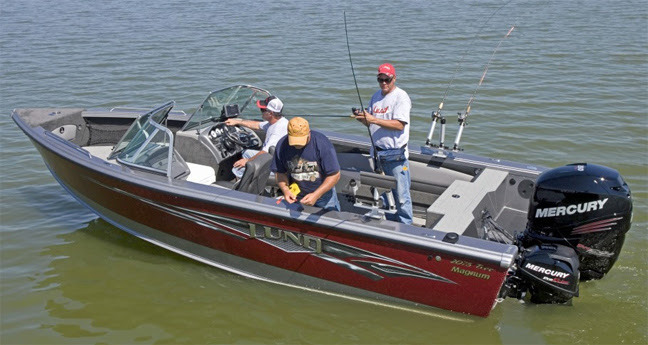 For more information on the new 2075 Tyee Magnum, or to shop Lund’s full selection of fishing boats, visit www.lundboats.com. Next Return of the Tiller.